If you’re in the market for a borazon wheel, Eagle Superabrasives is a premier supplier of borazon, CDX and Diamond Wheels. With an extensive inventory of over 6,000 grinding wheels at our Hickory, North Carolina location, we are able to ship ninety-percent of orders same-day. We can even fill custom orders in as little as seven days. Borazon is a crystal that is created by heating equal amounts of boron and nitrogen at temperatures greater than 1800 degrees. It is the brand name of the cubic form of boron nitride (cBN). Depending on the chemical bond that is used, the colors can range from black to brown and even gold. CBN grinding wheels, referred to as borazon wheels, are mainly used in the machining of hard ferrous materials, cast irons and superalloys. They have replaced diamond wheels, which do not grind ferrous materials as well because of the carbon makeup. 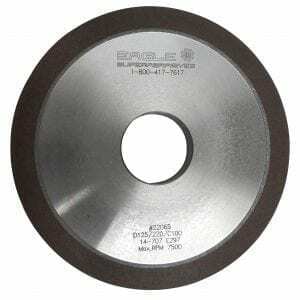 A borazon wheel can grind more material, to a higher degree of accuracy, than any other superabrasive. A borazon wheel is such a superior superabrasive product, that the only limiting factor in life of the wheel is determined not by wear on the cutting surface, but by its breakdown and separation from the metal core resulting from failure of the bonding layer. Our chemist and engineers work constantly in researching and developing different bond types to ensure the integrity of our wheels resulting in a longer wheel life. When you’re ready to try the best, trust the experts at Eagle Superabrasives. You can expect unparalleled customer support and service, give us a call. Our experienced staff is dedicated to providing our customers with high quality products and unequaled service. We offer experienced technical support and advice to assist you along the way. If you would like to read more about Borazon Wheels click here.